Winter is taking a long time to go away; luckily this year none of the roses show real frost damage and they are looking promising. Some of the roses are starting to bud, with Thérèse Bugnet on the lead. 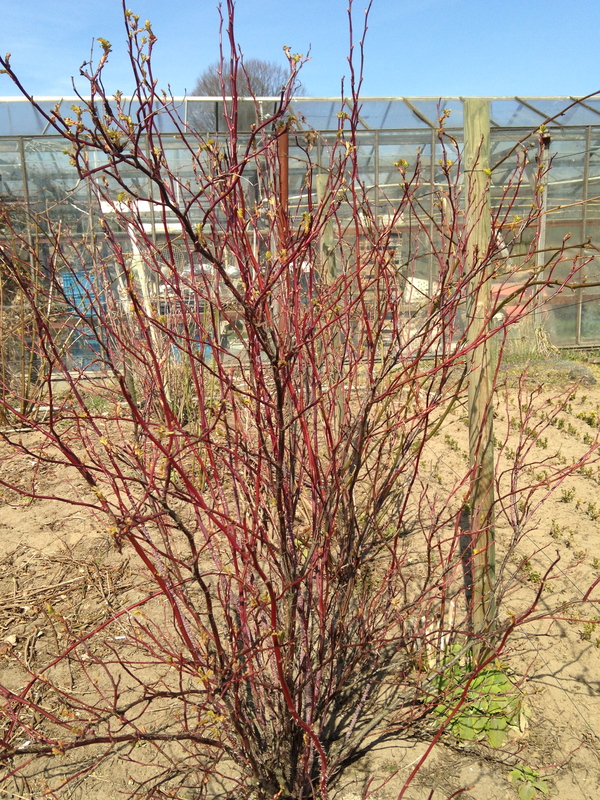 She is always the first to bloom and her red branches are a spectacular site in the still bare garden. My new beauty Mme Ballu is also showing signs of life and I can not wait to see the first blooms. Last week in the freezing cold I pruned the roses, that is to say, I only removed some dead branches, and sprinkled some dried organic manure around each bush. Hopefully starting today spring will come round and a new rose year is about to begin. Dit bericht werd geplaatst in News en getagged met Therese Bugnet op 7 april 2013 door admin. Yesterday I attended a very interesting lecture by Ingrid Verdegem at the annual meeting of the Dutch Rose Society, about the identification of old roses with the help of antique painted rose pictures. Ingrid Verdegem is the author of the books The Quest for the Black Rose and Oeillet Flamand, and is internationally renowned for her knowledge on the field of old roses. She mentioned the fascinating rose book ‘Die Rosen’ by Carl Gottlob Rössig and told us who he was, which roses he mentioned en what his opinion was about these roses. She showed us beautiful slides from some of the old rose paintings, which were made with great detail. Also she spoke of his contemporaries, such as Andrews, Lawrance, Piñhas and Redouté, and of the differences of the printing technics that were available in the different periods. I’ve learned that the fabulous pictures of Redouté were made by the use of the stippling etching technic, enabling Redouté to bring incredible botanical detail in his pictures. Rössig used another simpler engraving (lining) technic, which were then colored by hand, also with great detail. When he died his work was taken over by other ‘artists’, but these later pictures sadly lacked the eye for detail and are no match and not to be compared with the earlier work of Rössig. 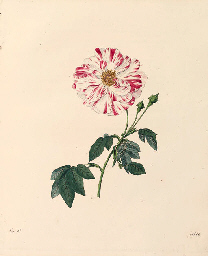 For the identification of numerous old roses these antique pictures from Redouté as well as the earlier pictures from Rössig, are invaluable and are still much appreciated. Ingrid Verdegem is a very fascinating speaker and her knowledge of old roses is phenomenal; I would love to see her garden and take a glimpse at her impressive library of old books! Dit bericht werd geplaatst in roses en getagged met Ingrid Verdegem, Redouté, Rössig op 17 maart 2013 door admin. I’ve posted some new pictures on the site and added more roses. There is now a description of the Mosses (in general) and of the Moss rose Général Kléber; also I have updated the description of the Gallicas. Dit bericht werd geplaatst in News, roses op 10 maart 2013 door admin. Just started building my very own website about old roses. The site is still ‘under construction’, but the basics are there! Gisteren begonnen met het bouwen van mijn eigen website over oude rozen; de site is nog ‘onder constructie’, zoals dat zo mooi heet, maar de basis is er. De meeste teksten zullen in het Engels op de site komen te staan, omdat veel oude rozen liefhebbers zich buiten Nederland bevinden en Engels daardoor meer geschikt is om informatie uit te wisselen. Gelukkig spreken wij Nederlanders ook een aardig woordje over de grens. Dit bericht werd geplaatst in News op 2 maart 2013 door admin.